Well maintained 325Ci. Minor oil leaks. Do you have an early-2000’s BMW with the venerable M54 6-cylinder under the hood? Does it ever get cold in your area, like in the 20° F or lower range? If so, you may be driving on borrowed time. A friend recently experienced what his mechanics were telling him was a catastrophic motor failure on his perfectly maintained E46 2004 325Ci. Eventual cause: failed BMW Oil Separator. On a cold morning he let his car warm-up briefly prior to leaving on his 20-minute commute to work. Ambient temperatures were hovering around 5° F, but the gauges indicated the car was warm about 10-minutes into his drive. About 15-minutes into his drive he went to accelerate around a row of slowing cars and he noticed his car was not accelerating and the car was billowing smoke. He noticed quickly enough that he engaged the clutch and pulled onto a side street, and the engine died. No “check engine light” or “low oil pressure” light illuminated, the only telltale that anything was wrong was his battery light. At this point he noticed an acrid smell (in his engineering speak he muttered: “it smelled like f*^&ing burning wax!”) and said smoke was pouring out of the vents. Fortunately, the shop had down time and the outside temperature warmed enough for them to investigate the issue further. Sure enough, they were able to pump the oil out of the cylinder (which shot across the parking lot) and determine the oil separator (aka crankcase vent valve, or CVV) had failed catastrophically. The official TSB is republished below. Basically, if you do not have the cold weather version, replace it. Kits like this one are available various places online. open), which could result in engine damage. 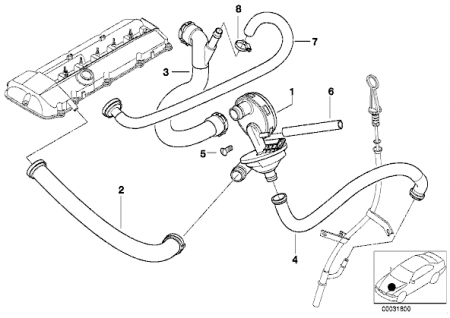 Replace the crankcase vent valve, crankcase vent hoses, and dipstick guide tube. 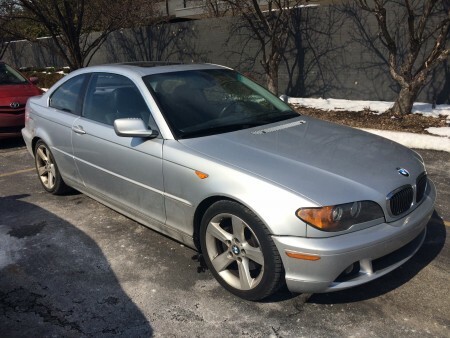 Below are links to two thorough write-ups and a nice little YouTube video for the E46 chassis cars that describe the fix. It appears to be straight-forward, if not tedious, but hopefully, this will keep it from happening to you.